"Sampath Speaking" - the thoughts of an Insurer from Thiruvallikkeni: Afful stars in Ghana's draw .... FIFA investigates blackface ..allegations of match-fixing ! Afful stars in Ghana's draw .... FIFA investigates blackface ..allegations of match-fixing ! FIFA fever is on …. A friend tweeted – ‘ when India fails in World Cup (Cricket), all blame IPL – but when England fare miserably in FIFA – why none blames EPF ?’ …. 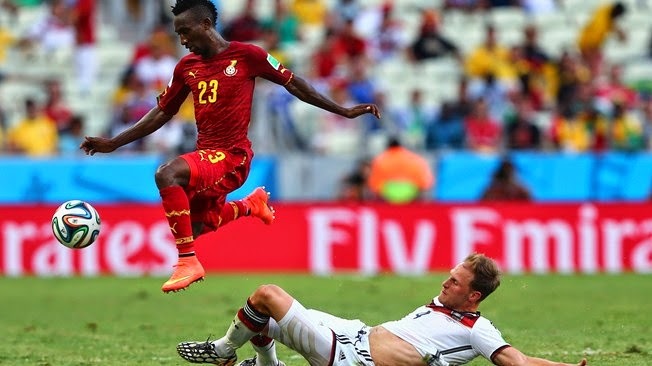 There were just five minutes remaining of an electrifying encounter between Ghana and Germany. The two sides had left no inch of turf uncovered at Estadio Castelao and the score was locked at 2-2. Yet despite the heat and humidity in Fortaleza - strength-sapping conditions for any player - there was one man who continued to charge around the pitch, dashing back to win the ball before roaring upfield again to send in a dangerous cross. That man was Ghana No23 Harrison Afful, who had been patrolling the Black Stars’ right flank all match long yet still seemed to have more pace and energy than any of the other 21 players on the field. A relatively unknown name on the global scene, performances like this would only mean Afful is unlikely to remain in the shadows for much longer. Ghana held on gamely to a 2-2 draw against Germany. Ghana, is a sovereign multinational state, a constitutional democracy, located along the Gulf of Guinea and Atlantic Ocean, in the subregion of West Africa. Ghana is the 82nd largest country in the world and 33rd largest country on continental Africa by land mass. The word Ghana means "Warrior King". The Ghana national football team is popularly nicknamed as the Black Stars. Though the team did not qualify for the senior FIFA World Cup until 2006, they had qualified for five straight Olympic Games Football Tournaments when the tournament was still a full senior national team competition. The team has won the Africa Cup of Nations four times; at 2010 FIFA World Cup in South Africa, they became only the third African team to reach the World Cup quarter-finals. There is news that FIFA is investigating after photographs circulated of fans wearing black face makeup at Germany’s match against Ghana. 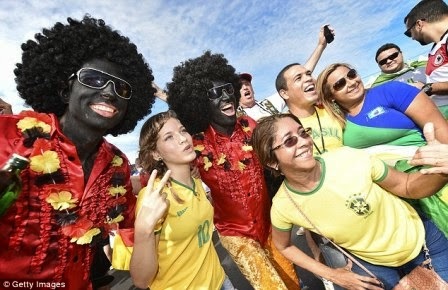 FIFA is investigating a possible racial discrimination case after photographs circulated of fans with blackface makeup at Germany's match against Ghana. Images posted on social media networks showed two men, appearing to be Germany fans, with blackened faces in the Fortaleza stadium on Saturday. FIFA said Sunday that its disciplinary committee is considering opening a case. It will also consider a report by the FIFA match commissioner, Eggert Magnusson of Iceland. ''We do not respect any discriminatory messages.'' FIFA spokeswoman Delia Fischer said. In a second incident, a man ran onto the pitch in the second half of the 2-2 draw. The shirtless fan had an email address and telephone number written on his back. He was ushered away by Ghana midfielder Sulley Muntari before being detained by stewards. Daily Mail reports that Germany has a tradition of blacking up, often for theatrical purposes, that despite its burgeoning ethnic minority population and the fact that it is now unthinkable in the UK and the U.S., still continues to this day ~ and that is not all …… Firstpost reports that the Ghana Football Association has been accused of entering into an agreement to fix international friendlies together with an agent registered with Fifa and an official involved in overseeing the country’s under-20 team. The allegations were made by the Daily Telegraph and Channel 4, which conducted a six-month joint investigation after receiving a tip that criminal gangs were looking to work with football associations to rig friendlies. According to the Associated Press, Ghana’s football association has denied the allegations and called in the police to “investigate two persons for misrepresenting the GFA with an attempt to defraud." The Ghana federation says no contract was signed and "the two gentlemen did not make such corrupt offers." While no players have been implicated in the investigation, the allegations threaten to cast a shadow on what has been a very exciting World Cup so far.